Italian auto company Piaggio is gearing to expand its market share in the three-wheelers and compete against the segment leader, Bajaj Auto. 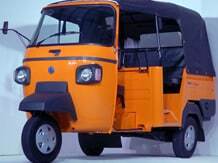 The company enjoys about 25 per cent share in the domestic three-wheeler market, where over 500,000 units are sold every year. “We want to increase our leadership in the cargo segment where we were the first mover almost two decades ago. In the passenger segment, we will focus on the alternative fuel (CNG and LPG) category in which we see a huge potential. With the kind of products and network we have, we can compete with Bajaj Auto anywhere. India is a huge market and metro cities are seeing a strong volume growth,” said Diego Graffi, CEO and managing director at Piaggio Vehicles. Piaggio sold 111,730 units of three-wheelers (cargo and passenger variants) in the April-December period of the current financial year when its sales declined by over 5 per cent. On the other hand, Bajaj Auto sold 247,408 units, registering a 22 per cent growth. Piaggio also sells small commercial vehicles for goods, though the volume here is about 150 units a month. Piaggio is also the third biggest exporter of three-wheelers from India (after Bajaj and TVS) and shipped over 18,000 units in the first nine months of the financial year. Piaggio is ahead of Bajaj in cargo three-wheelers and enjoys close to a 50 per cent market share. Of its total three-wheeler sales in the April-December period, 41,286 units were cargo vehicles. Bajaj sold 15,423 units. Graffi said both the companies, Bajaj and Piaggio, were players in the same market. “But, we are different in terms of product. The product portfolio is same, but our strength and focus are different,” he said. Graffi, who was earlier the global head of purchase and procurement at the division for Piaggio, said the Indian market accounts for over 30 per cent of the volume for Piaggio. “India is a fundamental asset in the Piaggio Group, both in sales and profitability,” he said and added that the India business has been profitable for years. Piaggio has been selling three-wheelers in India since 2000 and it forayed into scooters in 2012. However, it has a 1 per cent share in the domestic scooter market where 5 million units were sold in the first nine months. It sold 50,493 units, growing 63 per cent year on year. Graffi said the company is not interested in the market share as far as two-wheelers are concerned. “We are focused on offering differentiated products to our customers. I won’t call it premium, but unique compared to rest of the market. Our aim is not to be a mass player at least in the next five years. This is not our mission in two-wheelers,” he said. The company sells scooters under the Vespa and Aprilia brands in India. Vespa has strong recall in the Indian market owing to its former range of scooters when Piaggio was manufacturing scooters with LML. The partnership came to an end two decades ago, and Piaggio re-entered the segment in 2012. On electric mobility, Graffi said the company had technology for both three- and two-wheelers, and would implement it for the Indian market when required. “We are doing internal studies. The cost of the battery is still a roadblock and infrastructure needs to be ready. Once it is implemented, it will expand rapidly," he added.